It's going to be a while before Kingdom Hearts III is completed, and a new video gave us a sneak peek. 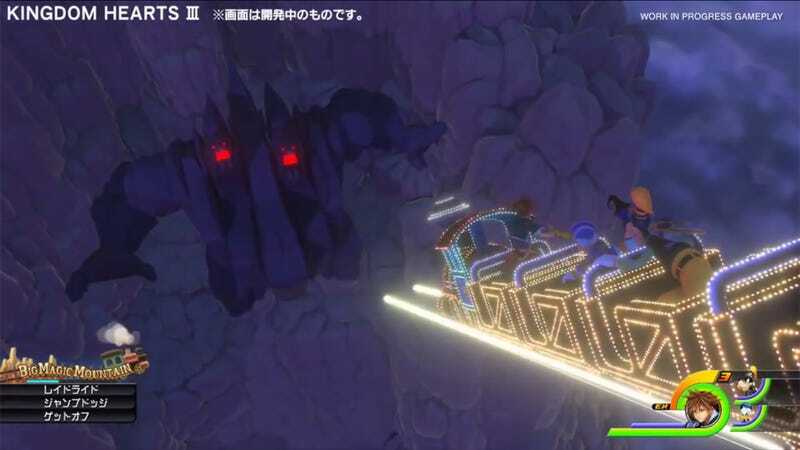 KHIII designer Tetsuya Nomura also recently provided more details about the game's visual flair, expressing his desire for the game to look oh so Disney. As previously stated, Kingdom Hearts 3 will have a more brush-like visual style as opposed to a more photo realistic look. Nomura spoke about this visual style in an interview with Weekly Famitsu. "We don't have an official name for it, but we have something called the 'Kingdom Shader.' We showed it in the E3 trailer, but it's our attempt to 'Express Disney's 2D brushwork in 3D.' When deciding on the graphical direction for Kingdom Hearts III, we talked with [Square Enix's Takeshi] Nozue and the rest of Square Enix's visual development department, Visual Works, and had them prepare several different styles. Some were in a 'brushwork-like style' and they were developed into what you saw at E3. We have a development base where Visual Works makes a pre-rendered movie that we convert into a real-time render." "Ever since the first game, we've strived for a Disney-like brush quality in the graphic gradations. At the time, the [PlayStation 2] didn't have the processing power to allow us to freely adjust the lighting, so we had to make the brush-like visuals as textures. But the new hardware has become much more capable, so there is no 'no using lights' option. You can't get a real feeling of evolution by just making the standard graphics into HD, and I thought that simply recreating the pre-rendered movies from Kingdom Hearts and Kingdom Hearts II isn't the direction we should be going for the series in the next generations, so the 'Kingdom Shader' was born." As for what fans can expect in Kingdom Hearts III in terms of new worlds and characters, Nomura was much less open, stating only that, "We've already chosen some worlds and have begun development, but I can't specifically say 'this world' or 'this character will appear' at this point in time. We will offer more information as time goes on, but comparatively, there are more new worlds and many Disney works that haven't shown up yet will make an appearance." Hopefully, "as time goes on" will be relatively soon instead of having unbearably long breaks in new info and end up with people asking what the Hell is going on rather than be excited... *cough!*Versus*cough! *.